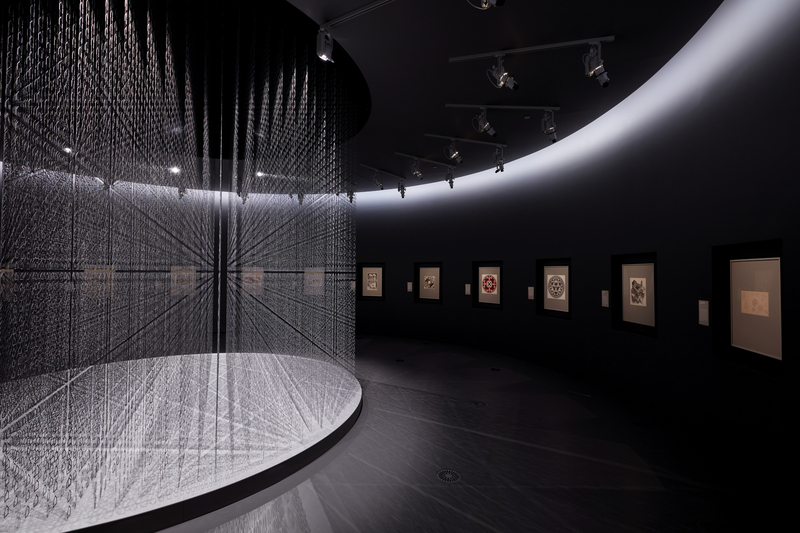 The NGV’s current blockbuster exhibition, Escher x Nendo: Between Two Worlds, is an unconventional biography of the celebrated Dutch artist. 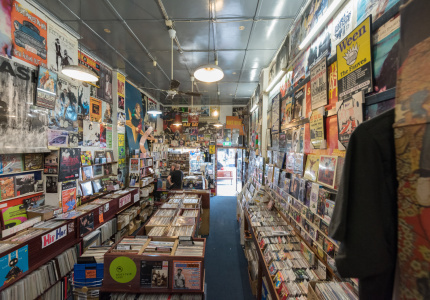 In partnership with NGV, we look at his detailed world-building and highlight three important works. M.C. Escher isn’t known for his human touch. Relativity (1953) depicts a mind-bending structure of impossible staircases; Belvedere (1958) is a two-storey tower that defies geometry. 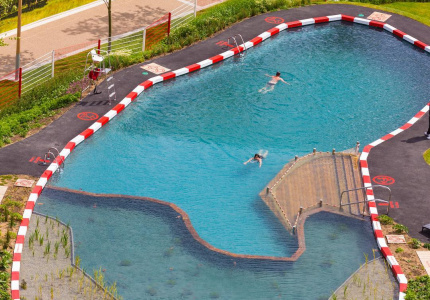 The Dutch illustrator’s work successfully uses mathematical precision to create fantastical illusions. 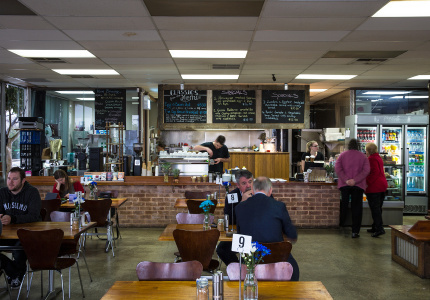 The side effect is a feeling of absence behind the masterful artworks. Time magazine once referred to his drawings as “clear and cold as snowflakes”, a comment on both their devastating precision and lack of emotion. And yet there is an emotional punch behind NGV’s blockbuster show Escher x Nendo: Between Two Worlds. 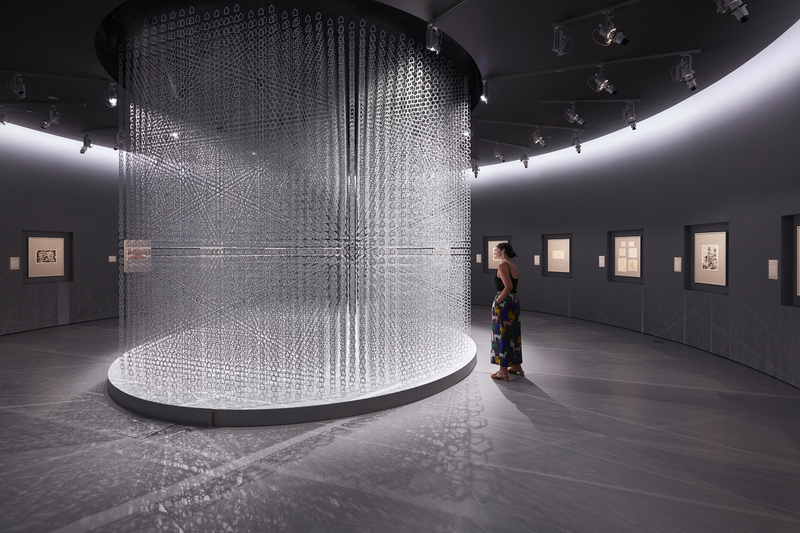 First-time visitors are immediately drawn to the exhibition design of the Japanese design studio Nendo, whose psychedelic proportions, projections, sculptures and optical illusions both support and sometimes overshadow Escher’s work. But looking beyond them, we see not just a catalogue of work, but a deeply insightful biography of a man. Escher’s most famous works are precise renderings of man-made structures. 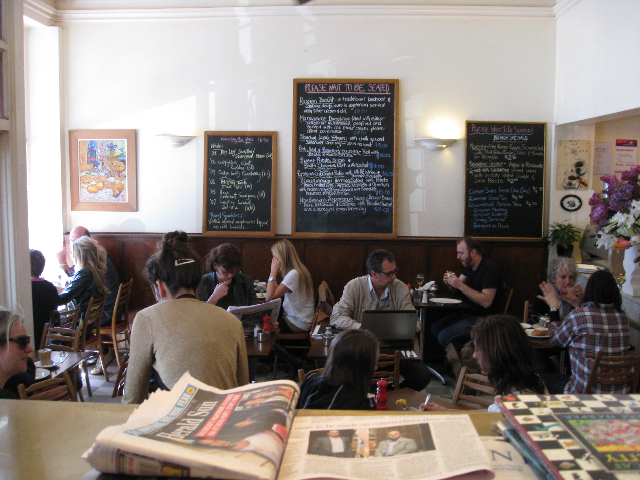 But the artist claimed not to be interested in architecture. In one of the first rooms of the exhibition, we see an early example of his detailed renderings of structures – these ones natural. Alongside Freighter (1936), which depicts the deck of a ship against a backdrop of rolling ocean, is Vitorchiano nel Cimino (1925), a woodcut of an Italian town north of Rome. In it, ancient stones cling to cliff faces, each element rendered with precise jagged lines. Hedges, fields and roads curl and twist at its base. 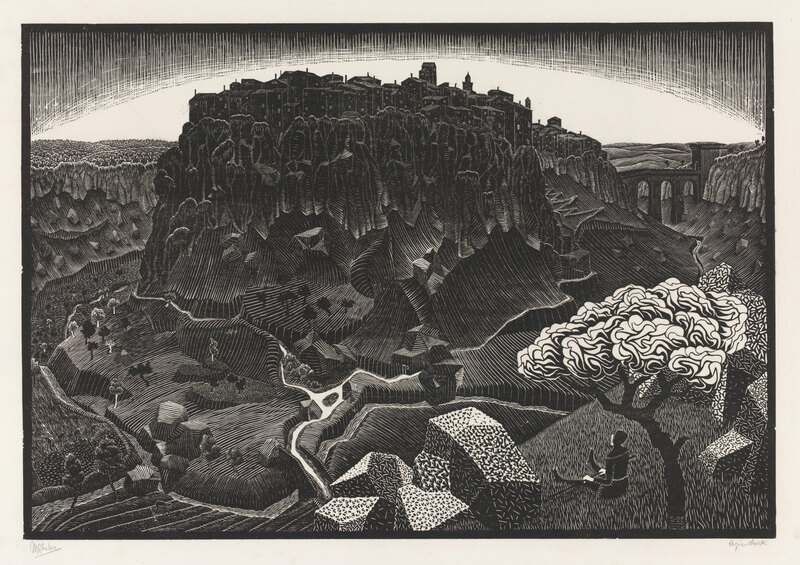 In the foreground, a lone figure sits under an olive tree, dwarfed by depth and scale. 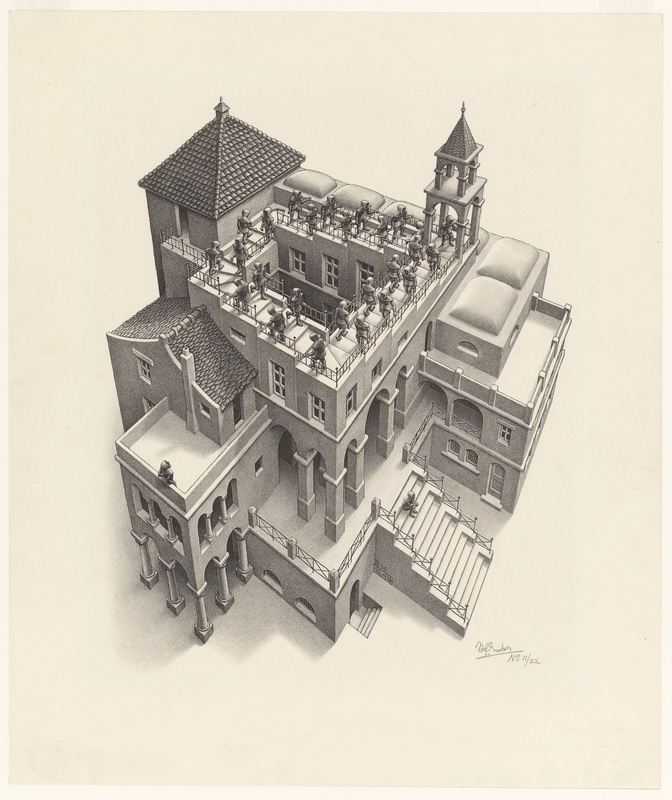 While developing his technique, Escher was becoming more and more interested in innovative perspective. 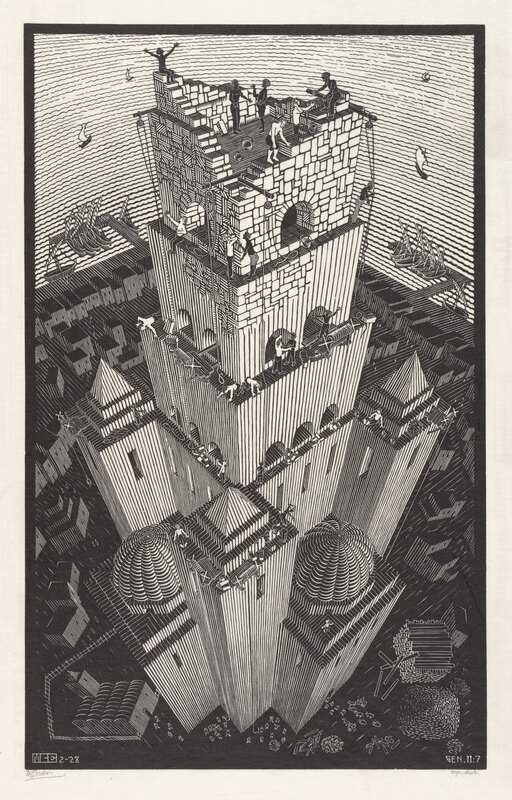 His work Tower of Babel (1928) is a good early example of this burgeoning exploration of perspective. We view the tower from directly above, giving us an off-kilter vantage point. It’s an example of how Escher was finding illusion in the everyday, in mirrors or reflections. He pushed this further in Castle in the Air (1928), which shows an island floating above the ocean. Beneath it, on an ocean of parallel lines, a child clings to the back of a floating turtle. 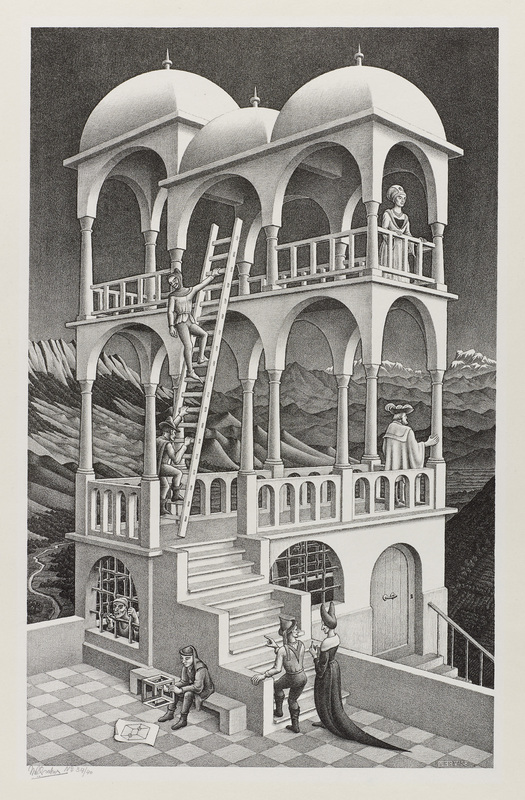 It’s based on the fairytale The Lost Princess (which Escher read as a child) and a sign of his moving away from an observation of reality into pure fantasy. Leahy says Escher himself never excelled academically, but he was an intuitive mathematician. For example, Escher developed his own geometric-based systems to explore visual recordings of duality, repetition, patterns, and infinity – all mathematical principles. 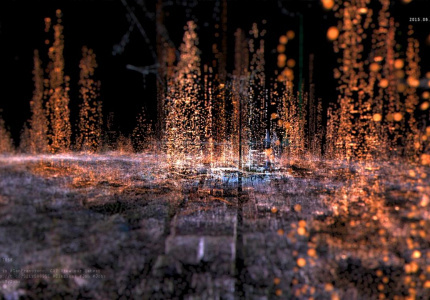 The effect on his work was profound, and his art became increasingly surreal. Nendo’s response to this use of mathematics to create visual harmony is best seen in Gathered House, a centerpiece of Escher x Nendo. Thousands of laser-cut miniature houses combine to trick the eye and create the illusion of a much larger, floating house. It reflects Escher’s explorations of tessellation, when he began to warp the limitations of reality. A town becomes a tessellated pattern then a man, birds become fish, lizards are reduced to interwoven patterns. 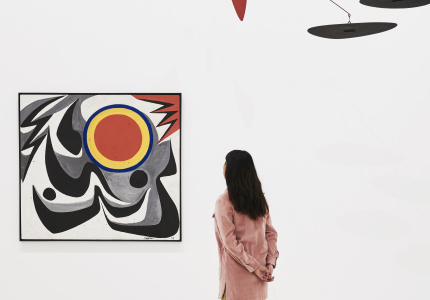 As we move through the exhibition, we see these playful motifs give way to the impossible congress of realism and abstraction. 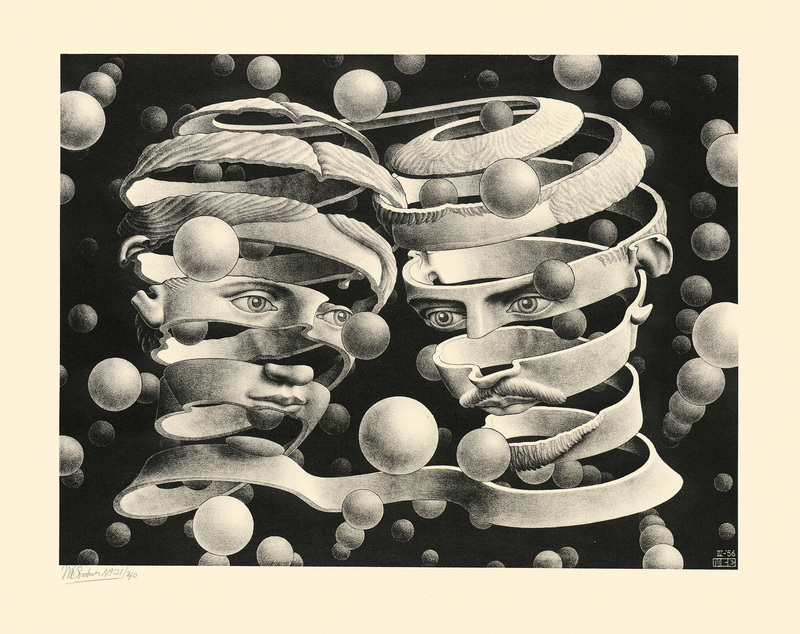 The lithograph Bond of Union (1956) shows a ribbon tangled into the shape of two faces – Escher and his wife; in Ascending and Descending (1960) a group of monks climb an infinitely looping staircase. These iconic works represent the culmination of Escher’s concerns: mathematically derived impossibilities rendered as precisely realised structures, which elevate them to the realm of fable. For all its playfulness, Between Two Worlds ends on a bittersweet note. 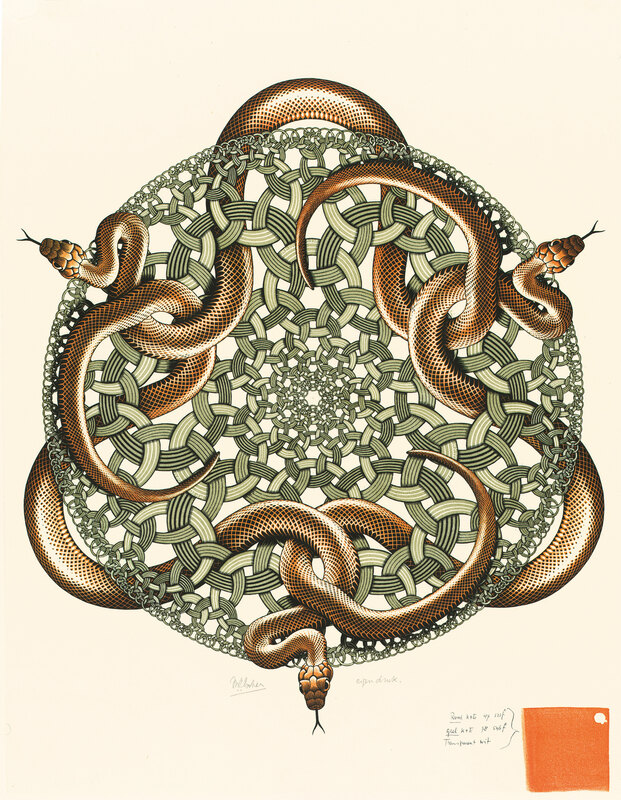 In a final, winding room we find Snakes (1969), Escher’s final work. It’s an incredibly detailed circular tangle of snakes and interlocking circles, each getting progressively smaller towards the centre. 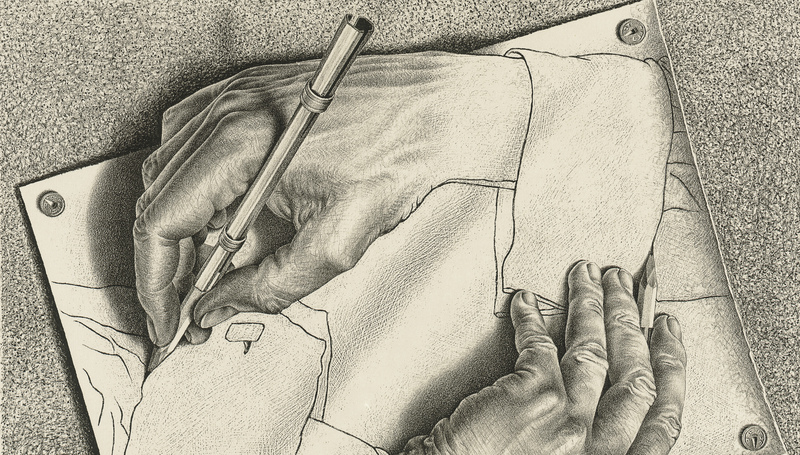 Escher’s line work gets finer and finer until it’s almost indiscernible. According to the NGV it’s Escher’s “most absolute representation of infinity”, and “the final articulation of his lifelong fixations”. Escher created Snakes in his early seventies with a magnifying glass and neon light to aid his failing eyesight. His wife had left him a few years prior in 1968, and he was suffering a prolonged illness and undergoing regular bouts of surgery. He realised it would likely be his last work. Soon after its completion he moved into Rosa Spier Huis in the Netherlands, a retirement home for artists, where he died in 1973. Snakes was the end for Escher. But not for Between Two Worlds. Around the final corner of the exhibition, in a callback to the introductory print, is one of his most well-known works, Drawing Hands (1948). It shows two hands drawing one another in an impossible, paradoxical, infinite loop. 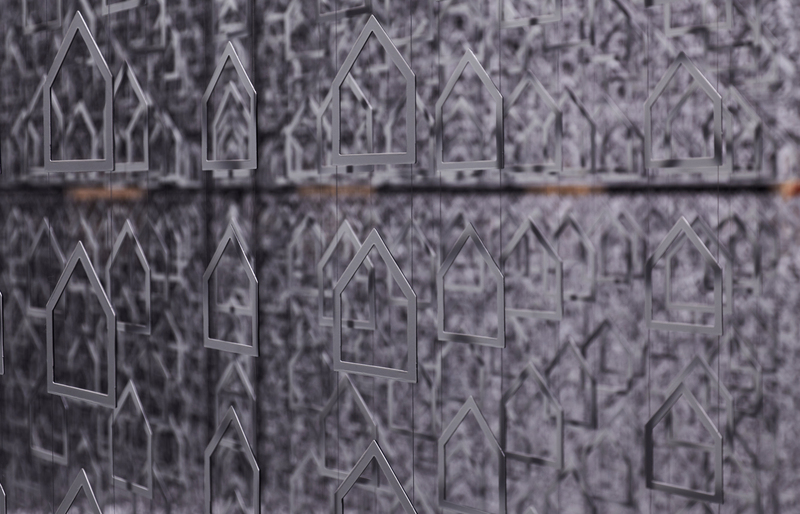 In its final week Escher x Nendo: Between Two Worlds is open early from 8am, April 1-7, and late 6pm-10pm, April 4-7. 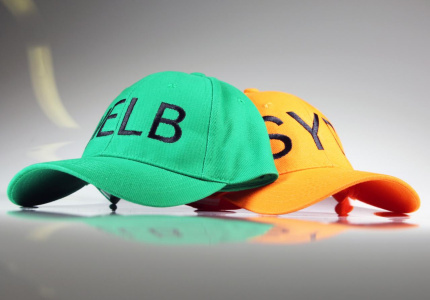 Book tickets. 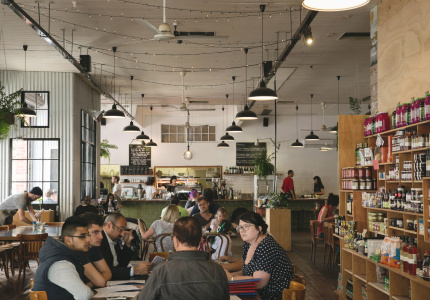 This article is produced by Broadsheet in partnership with NGV.